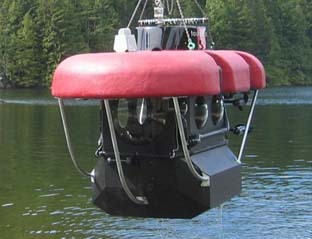 The TourSub is a six-person commercial sub built by International VentureCraft (IVC). The submersible is designed to provide undersea trips for tourists. The TourSub has been equipped with a large battery and air supply allowing for a full day of diving without the need for a recharge or resupply of air. The TourSub is fitted as standard with features including an auto-hover system, built-in SONAR, and fly-by-wire joystick control. Additional features like lighting, ultrasonic communications and an increased air supply can also be added.